Motorists weren’t the only ones eager to test out the new stretch of Interstate 11 that opened a little less than a month ago. Arizona Game and Fish Department A herd of desert bighorn sheep grazes its way over U.S. Highway 93 in Arizona east of Hoover Dam using one of three wildlife bridges opened in 2011. Tony Illia/Nevada Department of Transportation This bridge over Interstate 11 east of Boulder City was built for bighorn sheep. In the coming months and years, wildlife officials in Nevada and Arizona plan to use remote cameras and tracking collars to determine whether animals are actually using the $1.2 million wildlife overpass. On the day of the ribbon cutting, Arizona Game and Fish Department biologist Jeff Gagnon spotted a desert bighorn sheep trotting through one of four underpasses built to protect wildlife from traffic and traffic from wildlife. Only time will tell if the sighting was a fluke or the beginning of a welcome trend. In the coming months and years, wildlife officials in Nevada and Arizona plan to use tracking collars and remote cameras to determine whether animals are actually using the several million dollars worth of wildlife crossings built as part of the first addition to the nation’s interstate highway system since 1992. There’s reason for hope just up the highway in Arizona, where three unusual overpasses with no exit ramps, road signs or pavement have effectively eliminated collisions between cars and sheep on U.S. Highway 93. The bridges were built at a cost of $4.8 million and opened in 2011, after extensive study and consultation with Arizona wildlife experts. Gagnon said about a dozen bighorns a year were being hit on the highway before the improvements were made. That number dropped to five the first year after the wildlife crossings went in, but wildlife officials still weren’t satisfied. They added more cattle guards and adjusted the fences leading to the crossings. Then they installed “escape ramps” so the occasional sheep that do find their way onto the highway can jump back over the fence. “We haven’t had a single accident since 2014,” Gagnon said. The sheep didn’t embrace the new bridges right away. During that first year, wildlife and transportation officials recorded just 250 crossings. That increased to 2,150 in the second year — an impressive volume of traffic considering the bighorn herd in the area only includes a couple hundred animals. The success in Arizona did not go unnoticed in Nevada. When transportation engineers began work on the new stretch of I-11, Gagnon and company were asked to help consult on the design alongside the Nevada Department of Wildlife. “From their experience, they were able to suggest some new design ideas,” said Brad Hardenbrook, NDOW’s supervisory habitat biologist for Southern Nevada. The collaboration began in 2014, when wildlife experts from the two states teamed up to catch and collar 25 bighorn sheep in the mountains now split by the interstate. The GPS data transmitted by the collars was used to track the movement of the animals before and during highway construction. Once the batteries ran out on those collars, another 25 sheep were fitted with transmitters last year, allowing the monitoring to continue beyond the highway’s official opening Aug. 9. 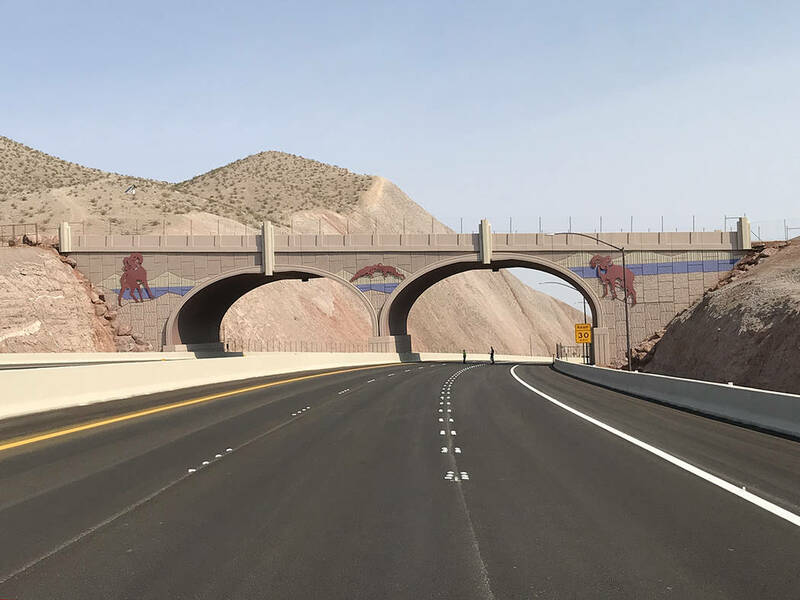 According to Tony Illia, spokesman for the Nevada Department of Transportation, the new 15-mile stretch of I-11 includes one overpass and four underpasses for wildlife. The sheep bridge cost about $1.2 million. It’s harder to tease out the cost of the underpasses because they are an integrated part of bridge structures that would have been built anyway, Illia said. The primary purpose of the wildlife crossings is “traveler safety,” he said. The crossings also should help counteract habitat fragmentation, which can occur when a new highway is cut through a wildlife area. 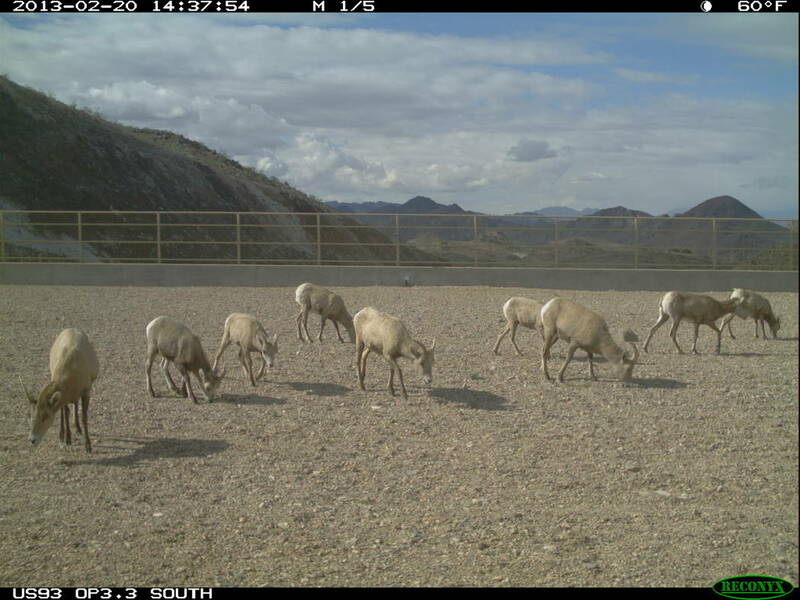 Such “connectivity” is important for herd animals like bighorn sheep, Gagnon said, because it often increases their access to food and water and allows for the sort of genetic mixing between groups that can improve disease resistance and overall population health. Arizona’s statewide research biologist explained it this way: Imagine suddenly being walled off from your neighborhood supermarket, and the only place you can buy food is the convenience store down the street. Your quality of life might suffer, but you’ll probably survive — at least until you get walled off from the convenience store, too. He expects the I-11 wildlife crossings to see use by a whole range of animals, not just sheep. But there’s one key difference between two road projects: While U.S. 93 has been around for decades, I-11 presents a barrier that didn’t exist before, so biologists can only guess at how wildlife will react. Hardenbrook said the new highway cuts right through the part of the Eldorado Mountains bighorn sheep seemed to like the most. Then again, the opening of I-11 will also significantly reduce traffic on the old stretch of U.S. 93 between Boulder City and Hoover Dam, making that road easier to cross for sheep moving between the Eldorados and River Mountains to the west. Hardenbrook said the designs for I-11 were changed to accommodate heavy sheep traffic at the eastern end of the project, where engineers jettisoned plans for a solid-rock ramp in favor of a bridge that the animals could cross underneath. All of the wildlife underpasses on the project were designed to be as open as possible, he said, because bighorns “like to cross over things” not under them. ‘We’ll see just what kind of response the sheep will give us as time goes on,” Hardenbrook said. The new stretch of Interstate 11 near Boulder City isn’t the only place in Nevada with special bridges and underpasses made for wildlife. The Nevada departments of Transportation and Wildlife teamed up to install five animal crossings over and below U.S. Highway 93 north of Wells to reduce vehicle collisions with migrating deer and other animals. Transportation officials have also built an underpass for livestock and wild horses on U.S. 50 near Silver Springs, a crossing on Interstate 80 between Oasis and West Wendover and a tunnel for desert tortoises on U.S. 95 south of Boulder City. NDOT also plans to put in a new wildlife underpass, cattle guards and 10 miles of deer and tortoise fencing along state Route 160 as part of a $58.6 million project to widen and upgrade the highway between Mountain Springs and Pahrump that is slated for completion in August 2020.